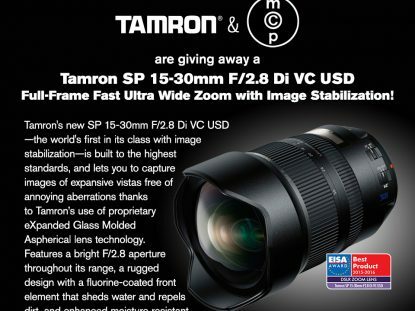 Here’s your chance to win a Tamron 15-30mm lens with image stability – for your Canon, Nikon or Sony SLR. Nikon is preparing to launch a couple of compact cameras in the near future. We know this because their manuals have just been posted on the web by the Japanese company itself. They are called Nikon Coolpix A10 and A100, while their product launch event might take place at the upcoming Consumer Electronics Show 2016. The rumor mill is back with new information about the Nikon D5. The details are coming from a traveling photographer who was visiting a camera store. A functional unit of the DSLR was showcased in the store and the customer managed to grab some new Nikon D5 images before leaving. Here they are! Here’s your chance to win a Tamron 35mm or 45mm lens with image stability – for your Canon, Nikon or Sony SLR. Here is what you have been waiting for a long time: the first Nikon D5 photos. The DSLR has appeared online in a series of leaked images that are revealing some unknown details about it. Moreover, the megapixel count of the sensor has been confirmed, too, along with some changes made to the button placement. Trusted sources have managed to confirm some previously-leaked details about the Nikon D5. The DSLR will replace the D4s as initially believed: in early 2016. Moreover, the autofocus system will be better, while the native maximum ISO of the camera will be higher than what you can currently find in the D4s. After some recent rumors said that Samsung will close its camera division, while halting camera sales in select markets, the alleged reason may have surfaced online. A trusted source is reporting an intriguing rumor, which says that Nikon has actually purchased Samsung’s mirrorless technology. Here’s what you need to know! It has been a while since we last heard about the Nikon D400. Well, this DSLR is back in the rumor mill and it seems like it is coming soon. Trusted sources are reporting that the D300s replacement might finally become official in early 2016, possibly at CES 2016, along with the upcoming FX-format flagship DSLR, called D5. Bad news for Nikon DSLR photographers looking to buy a AF-S Nikkor 24-70mm f/2.8E ED VR lens! The optic’s release date has been delayed officially. The Japanese company has confirmed that the stabilized 24-70mm f/2.8 lens is now scheduled to become available sometime in October 2015 instead of August 2015. It is firmware day for photographers using Nikon gear. The Japan-based company has released new updates for a couple of its fixed-lens cameras. The Nikon Coolpix P900 firmware update 1.2 is here to fix a couple of issues for the users, while the Coolpix S6700 has also received a new firmware to fix one problem. Nikon has revealed its latest report concerning the sales and earnings of the first quarter of the 2016 financial year. Despite the fact that camera and lens sales decreased, the company reported an increase in sales value and operating income thanks to weaker yen as well a reduction in operating costs. After patented the 1 Nikkor 7.2-13.6mm f/3.5-4.5 AW lens roughly one week ago, Nikon has patented yet another CX-mount optic for 1-series mirrorless cameras with 1-inch-type sensors. The company’s latest patent is referring to a Nikon 10-45mm f/4.5-5.6 AW lens, which can be taken underwater and has an inner zoom mechanism. If you are following the digital imaging market, then you are probably aware that Nikon is selling a camera with an 83x optical zoom lens called Coolpix P900. Now, it is time to reveal the fact that the company is working on an even more impressive shooter, called Nikon Coolpix P4000, that features a 200x optical zoom lens. After announcing three new lenses in early July, Nikon is now unveiling another three lenses in early August. The first of them is the sought-after and much-rumored AF-S Nikkor 24-70mm f/2.8E ED VR. The new Nikon 24-70mm f/2.8E ED VR lens replaces the older model with a built-in image stabilization technology and more. Nikon has just taken the wraps off of its second lens. The brand new AF-S Nikkor 200-500mm f/5.6E ED VR has been unveiled as an affordable and lightweight super-telephoto zoom lens for action and wildlife photographers. The Nikon 200-500mm f/5.6E ED VR lens will be released on the market this September. The third and final announcement of the day from Nikon consists of the AF-S Nikkor 24mm f/1.8G ED fast wide-angle prime. This new optic promises to deliver excellent image quality in challenging lighting conditions. The Nikon 24mm f/1.8G ED lens is a compact and lightweight optic that will be released with an affordable price tag. Nikon will definitely announce three new lenses which have been rumored in the past. The certainty comes from the fact that a source has leaked their photos as well as details about their specs and prices. Without further ado, the Nikon 24-70mm f/2.8E ED VR, 24mm f/1.8G ED, and 200-500mm f/5.6E ED VR lenses will be unveiled soon. Nikon has patented another lens that is designed for the company’s CX-mount mirrorless cameras with 1-inch-type sensors. The product in question is a Nikon 7.2-13.6mm f/3.5-4.5 AW lens that will be capable of taking photos underwater alongside the Nikon 1 AW1 mirrorless camera without taking damage in the process. A new milestone has been reached in the digital imaging world. Nikon has just confirmed that it has produced its 95 millionth lens ever. The company says that its lens production has reached the 95 million mark recently, while praising the recent advancements in optical technology, including the Phase Fresnel element. Nikon has been rumored to launch a 24-70mm lens with integrated image stabilization technology for a long time. The optic is coming soon and it seems like it will be accompanied by another model. A trusted source is reporting that a Nikon 200-500mm lens is in development and is on its way sometime in the near future. After recently introducing three new lenses for APS-C or full-frame DSLRs, Nikon has been caught patenting a zoom lens designed for compact cameras with smaller image sensors. The Nikon 10-65mm f/1.9 lens patent has been filed in Japan and it could be a part of one of the company’s future compact cameras with 1/2.3″-type sensors.